I recently finished editing a promo video for Claire Thorogood, who is an amazing Dog Portrait Artist based in North London. Claire started her painting business late spring 2016, and she wanted a video on her website that demonstrated the painting process so new clients could see what she did. We are both very proud of the finished video, which tells The Story of the Painting of Herbie, a 13 year old toy poodle. What’s incredible about this promo video is that Claire and her assistant Janet, shot most of the footage themselves on their iPhone. They did get training on how to shoot with their phone from me, and I created a storyboard of shots for them to collect, but they did all the hard filming work. 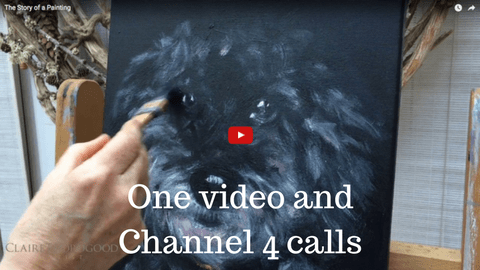 Since we made this video, Claire has opened her own studio in Hampstead and was invited to attend Crufts, painting no other that Iwan Thomas’s dog. What an amazing transformation in a business started just ten months ago. Now I’m not saying this self shot promo video was the sole reason Claire got the TV offer, but the broadcasters were able to watch it, see what she did, and decide whether what she did would work for the programme. You can watch Claire talking about working with me here and of course check out my business video programme which she went through in order to create this video. Why this may be of interest to you?… Well… The training and editing to help Claire make this video cost about 75% of what it would have cost if I had come in and produced this video for her, shooting everything myself… Also, this is just the first of many “Story of the painting” videos which Claire is planning to do, so all future story videos we produce together are going to cost her a quarter of the original fee, as she will only have to pay for the editing. Visit Claire’s website to see more of her amazing work. Fabulous! Not surprised you are both very proud of this it’s excellent! Love these videos. The editing is great.